At A-5 Star Carpet Care, our goal is to provide our customers with the best cleaning experience they've ever had. We offer free estimates and reasonable pricing. Call today! (239) 466-3779 Servicing Lee and Collier Counties. A-5 Star Carpet Care strives to be the best through continued education, superior technology and a strong support staff willing to help you in any way we can. Our mission is to help you understand the importance and health benefits of maintaining clean Carpets, Upholstery, Area Rugs, Tile & Grout and to provide the necessary services so that you can live a healthy, happy and clean life. 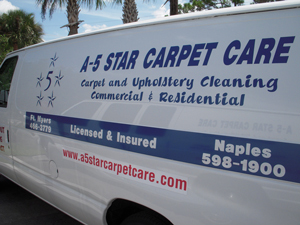 A-5 Star Carpet Care offers Carpets, Upholstery, Area Rugs, Tile & Grout cleaning. We also specialize in cleaning oriental and specialty rugs. Our additional services include the cleaning of natural stone, leather, boats, RV's and automobiles. See our Services section for more detailed information. We are certified in odor control and in carpet and upholstery cleaning. We offer free protector warranties on carpet & upholstery. Our dedicated technicians are only a phone call away, especially for your emergency red stain removal or water damage restoration needs. All of our work is 100% guaranteed. Check out our Before & After Photos for some real examples of how we have helped our customers with tricky cleaning needs. Copyright © 2019 — A-5 Star Carpet Care • All rights reserved.